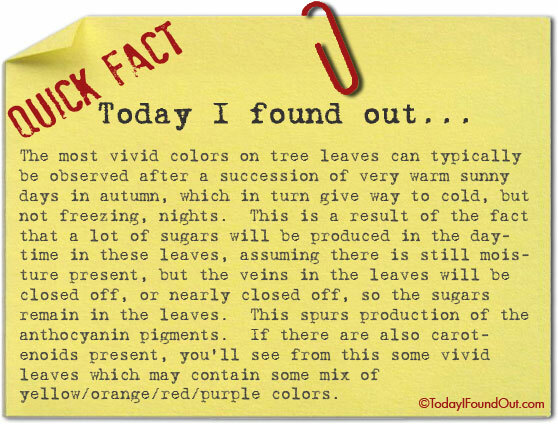 The most vivid colors on tree leaves can typically be observed after a succession of very warm sunny days in autumn, which in turn give way to cold, but not freezing, nights. This is a result of the fact that a lot of sugars will be produced in the daytime in these leaves, assuming there is still moisture present, but the veins in the leaves will be closed off, or nearly closed off, so the sugars remain in the leaves. This spurs production of the anthocyanin pigments. If there are also carotenoids present, you’ll see from this some vivid leaves which may contain some mix of yellow/orange/red/purple colors.